Geez, F4. How degrading can you all get? Or should I put the blame on your recording company & the director of your not-so-original music video? You're making me despise you guys even more. Okay, perhaps using the four seasons in music videos ain't a new idea. But what's puzzling me is that how can the scenes be so similiar. Especially when F4's MV showed the members walking in the background of different seasons. I wouldn't have known about it until I saw the headlines in Sin Chew's entertainment section. In the article, it stated that F4's new MV Waiting for you has been blamed by the media & fans for plagiarising Dong Bang's PV Step by Step. 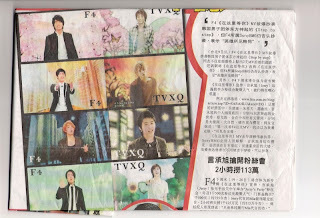 There were also pics included the article to show the comparison between F4 & Dong Bang's music video. There is no doubt that there is a slight resemblance in both videos. On the other hand, F4's recording company & management had denied all accusations in relations to the music video. As usual, they gave lame excuses just to avoid the problem. -_-"
I was shocked that whatever was mentioned in the article was true. How can it be so coincidental that both videos turned out to be so alike? I mean, I would only considered the similarity to be a coincidence if both videos were released at the same time. The prob is...F4 released their latest video months after Step by Step was aired on Japanese TV. In fact, it was aired last 2 yrs ago. Wouldn't that be plagiarism? Go to YouTube & watch both vids. You be the judge. Christmas at 1 Utama & Happy 2008!